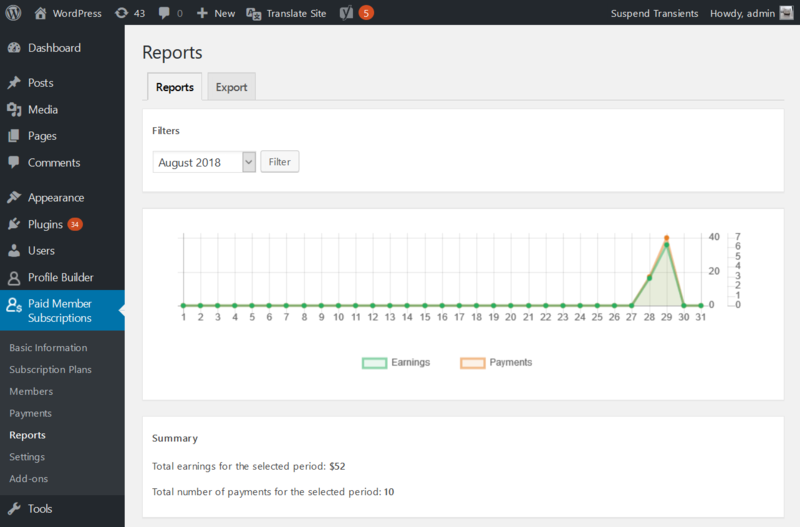 The Reports page from Paid Member Subscription plugin, allows you to easily keep track of your member payments and earnings for your membership site as well as export your user membership and payments. The green is for Earnings and the Orange one for Payments. This is how Reports page looks like. If you have completed payments, made in the selected period of time, the values will be represented in the graph and also in the reports summary. Whether you prefer to view your own records of your member database, you wish to run your own reports, or you simply need to import member data into another service or application, such as MailChimp or Excel, Paid Member Subscriptions allows you to export all member records to a CSV at anytime. Transaction history can also be easily exported to a CSV file, letting you then import the payment data into Excel, QuickBooks, or any other accounting software that can process a CSV file.